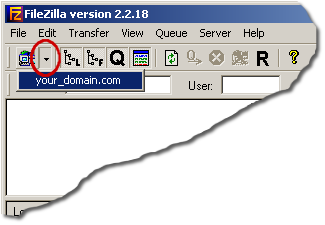 After you've downloaded FileZilla, You'll need to install it and configure it. 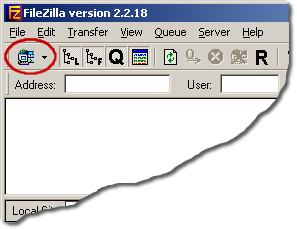 Please follow the instructions below for configuring FileZilla. Click on the Site Manager icon or click on File / Site Manager or CTRL + S.
The "Site Manager" window (shown above) will appear. Click on the New Site button. Type in your domain where it says New FTP Site. Type in your username you have to access your domain in the "User:" field. Type in your password you have with your domain in the "Password:" field. Once that's completed above, click on the little black down arrow next to the "Site Manager" icon. A list will drop down, click once on your domain name. This will now make a connection to your domain space on our web-server. Once connected you can start transferring files back and forth. The "Local Site" area is your computer's hard-drive. The "Remote Site" area is your space on our web servers. On the "Remote Site" area, you'll want to place your webpages and images under the public_html folder or the www folder. Which ever one is shown. To transfer files, simply click and drag the files from the "Local Site" to the "Remote Site" or vise-versa.